Visit Dressage diagrams for helpwith learning your tests or planning your kur. Correct contact loop reins from De Boiz help you keep a good steady contact. See right. I'm always on the look out for innovative products that can help me and other Para Equestrian riders to compete at top level. Here are just a few products that I use and would highly recommend. 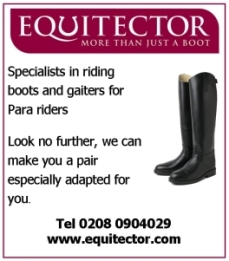 I have just discovered that the riding boot manufacturer Equitector is willing to make bespoke riding boots and gaiters for para riders like me. This is great because I have one leg wider than the other and was strugggling to find a pair of gaiters that wasn't either too tight on one leg or baggy on the other. You just need to take measurements to show the height of your leg to behind the knee, and at various points around your leg for the width, and Equitector will do the rest. They are really reasonably priced and you can, of course, get the boots to match. All para riders out there will be probably be interested to hear that www.dressagediagrams.com have just added all the new 2010 FEI para tests to their website. To help riders with a more visual learning style, Dressage Diagrams offers dressage tests in a diagram form. Each step of the test is shown as a map of the dressage arena with the required movements on it - a kind of route map. It's also brillient for designing your freestyle. You can build a complete dressage test and the website automatically generates the diagram as you go along. This interactive tool is really good and I would definitely recommend it. If you like the sound if this, why not sign up for a FREE TRIAL. If you like it, you might decide to subscribe, which starts from just £5. At Bramham Horse Trials I went to the WOW Saddles trade stand and sat on one of their saddles for the first time. All I can say is, I now understand why they are called WOW! It was so comfortable and the panels can be pumped up with air which could help even out any unevenness in my riding position. 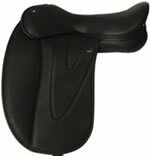 I am currently working with a physio to correct a twist in my position due to a weakness down one side of my body - I think a WOW saddle would really help so I'll start saving up right now! WOW! *STOP PRESS: I have managed to raise funds for a WOW saddle (also thanks to First Thought Equine for giving us a very good price). See September news for more info. I just discovered these great loop reins in 2005 and have been experimenting with them when riding Indi. He can sometimes be quite strong in the hand and because I have difficulty with gripping the reins they sometimes slip through my fingers and get too long - hence affecting my contact. To use modified equipment in competition, you must make sure you have permission from IPEC. They will need to check that the equipment you are using is compatible with your disability classification. I am hoping to get these reins added to my IPEC card but am still waiting to hear whether they have been accepted. However, even if I am not able to use them in competition I will still use them at home as they help me to get the feel of a correct contact and Indi also gets used to the fact that he can't pull the reins through my fingers. Once you get a certain piece of equipment added to your FEI Para Equestrian ID card you will also need to get the item added to your British Dressage Dispensation if you wish to use the equipment in able-bodied competition. Contact De Boiz for further information. Have you heard of this great product called Toestoppers? 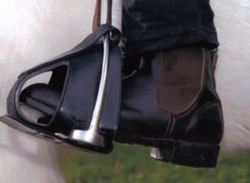 They're like Dapps or Devonshire Boots which a lot of RDA groups use to stop riders feet slipping through the stirrups, but they're much neater so less noticeable when you're riding in dressage. I was having trouble with my right foot slipping through the stirrup, particularly while I was getting used to Indi and they really helped. Also, I was riding at a training day for physios and they watched me ride without the toestoppers and then with them. All commented on the marked improvement in my position when wearing them. When my feet couldn't slip through the stirrups, I could keep my heels down and this stopped my weight tipping forward. This product is not just for disabled riders. You can use Toestoppers as a training aid to help train your foot to stay in the correct position, or they can be used to stop a rider getting dragged if they fall off when going cross country or schooling young horses. They come in a range of sizes and are distributed in the UK by a company called Animal Crackers. Visit the Toestoppers UK website for more information, or to order a pair. I'm lucky to have one of these arena levellers from Keep-A-Level and it really keeps our dressage arena in top condition. Our manege is 30m x 50m sand and rubber so we tend to put a 20m x 40m arena in the middle and you can get quite a dip where you ride on the track and the corners all the time. 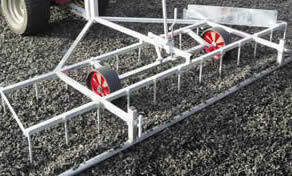 We use the towable version for rubber surfaces and you can get right to the edge to make the surface completely flat. This brand of leveller is used in lots of top equestrian centres including Hartpury College which will be hosting the Para Dressage World Championships in 2007. Visit the Keep-A-Level website for more information. For anyone who has been involved in an accident on the roads or just has to cope with hacking out on busy roads, it's clear that motorists need to be asked to slow down for horses as often as possible. I live on a dead end farm track that was recently surfaced with tarmac. Cars and lorries going to other farms and houses travel twice as fast now that the lane has a good surface. There have been one or two near misses when horses are being turned out and I am also amazed that none of our cats have been run over. Therefore, I am happy to recommend Equine Signs 'Slow Down for Horses' sign. Made from plastic but the same size as a genuine traffic sign it is hard to miss. Equine Signs also sell dressage markers and do vehicle graphics so their website is well worth a visit.